Please help us welcome Austenesque author Abigail Reynolds today during her blog tour in celebration of the release of Mr. Darcy’s Refuge, the ninth novel in her popular Pemberley Variations series. Whenever I read one of her creative and romantic takes on roads not taken in Jane Austen’s Pride and Prejudice, I feel a bit like I am in an Austen Twilight Zone. Readers familiar with Austen’s classic story will recognize characters and settings, but Reynolds always mixes it up, placing new impediments and challenges to Mr. Darcy and Elizabeth Bennet’s romance. There are always surprises, and, this new novel is no exception. The first few chapters had me laughing out loud as the story unfolds from Darcy’s point of view. He is even more arrogant and assuming then we ever realized. Ha! Abigail has kindly shared her thoughts on her writing career and her new book. Leave a comment to enter a chance to win a copy of Mr. Darcy’s Refuge. Enjoy! I’ve just spent the weekend at the Decatur Book Festival enjoying the company of readers and authors of Austen-inspired books, both fiction and non-fiction. One topic that arose repeatedly was how the world of publishing has changed in the last two years, and even in the last two weeks – yes, really, we discussed some significant changes that have taken place in the last fortnight! It made me think about how my personal writing process has changed as well. It took me 25 months to write and edit Mr. Darcy’s Letter, which was released in December 2011. In contrast, I started writing my latest release, Mr. Darcy’s Refuge in mid-January of this year, completing it in 7 months. Why so much faster? The easy answer is that I started cutting back on my day job early this year, giving me more free time to write, but that doesn’t completely account for it, since I probably spent one-third the hours on it overall as I did on the last book. The biggest difference was that I could write every day. When I have to take a break from writing for a week or more, I lose track of the flow of the narrative, and if I want to have good pacing, I have to go back and rework already written text before I start again. Even with detailed notes, I have trouble keeping scenes on track when there’s a large gap in time. It’s much harder to keep characters consistent and I have to do more revisions in order to keep the tone consistent through the book. Interestingly, when I look back at my books, the ones that are most popular with readers are the ones that I wrote the fastest. Certainly a book can be written too quickly, without enough care being taken to make it into a quality product, but can it also be written too slowly? Obviously, in my case, it can be. But what about Jane Austen? We have a reasonable amount of information about how long it took her to write her books. What does it show us? 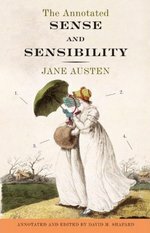 Let’s look at Sense & Sensibility, which Jane Austen referred to as her ‘suckling child’ – an interesting metaphor since it implies that she both loved it and felt drained by it. She had finished the first draft, then entitled Elinor and Marianne, quite quickly, since she read it aloud to her family before she was 20 years old. She returned to it two years later to do a full revision, changing it from an epistolary novel to a traditional narrative. Twelve years later she took it out again for yet another full revision, this time changing the name to Sense & Sensibility. It was published in 1810, fifteen years after she read the first draft to her family. She had been working on it for her entire adult life. In contrast, she started Persuasion when she was 39 years old, and wrote it from start to finish, including revisions, in just under a year. Naturally, she was a more experienced writer at that point, but I also wonder how the speed of her writing affected the book. I think of Persuasion as a delight – the tone, the themes, the characters, the background, all seem to flow seamlessly together as I read it. Sense & Sensibility, on the other hand, reminds me in some ways of Shakespeare’s ‘problem plays’ where there are gaps of style, consistency, or just basic characterization. I think of it as Jane Austen’s problem novel. While more polished than Shakespeare’s ‘problem plays,’ the flow of Sense & Sensibility isn’t as smooth as Persuasion, nor are the characters as consistent, and it’s sometimes hard to follow why certain characters care about other characters. It makes me wonder if Jane Austen also had to struggle with changing vision and loss of flow when the writing of a book spanned so many years. After all, a character created at age 19 would have to go through a major metamorphosis before meeting the standards of an author at age 34, and it would be almost impossible to erase all the traces of the earlier characterizations. My writing will never come close to equaling Jane Austen’s, or even make it into the same order of magnitude. I write light fiction for my own pleasure and that of my readers, and I’m very content producing the literary equivalent of comfort food rather than haute cuisine. Still, given how much I adore Austen’s writing, it’s very nice to be able to find some potential similarities in our experience as writers! Thank you for sharing your insights on your writing Abigail. Jane Austen also wrote for her own amusement and that of her family, so you share more than a few similarities. Best wishes for a great success with Mr. Darcy’s Refuge. Abigail Reynolds is a great believer in taking detours. Originally from upstate New York, she studied Russian and theater at Bryn Mawr College and marine biology at the Marine Biological Laboratory in Woods Hole. After a stint in performing arts administration, she decided to attend medical school, and took up writing as a hobby during her years as a physician in private practice. 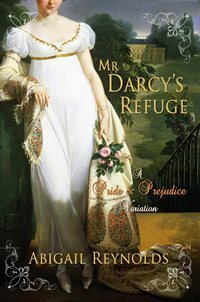 Enter a chance to win one of two digital copies available of Mr. Darcy’s Refuge, by Abigail Reynolds by leaving a comment either asking Abigail about writing her Pemberley Variations series, her new novel, or a remark about Jane Austen’s writing style by 11:59 pm PT, Wednesday, September 12, 2012. Winners to be announced on Thursday, September 13, 2012. Digital copies are available to download Internationally. Good luck to all. Thanks to Abigail and Laurel Anne — I love it that Abigail has put down in writing the very thoughts I have had about the protracted length of time, and changes in life that Jane Austen underwent during the “gestation” of Sense and Sensibility. Hey there fellow JASNA – Puget Sound member. Thanks Agnes for visiting today. It is very interesting to compare what Austen’s publishing process was 200 years ago to ours today. Think of the challenges she faced to self publish compared to Abigail’s. As a reader, I am certainly happy that it does not take 20 years to publish a book (for most). If Jane was living today, we might have nine books by her too, and more to come. Thanks for sharing. I’m glad to hear that you’ve thought about those issues as well, Agnes. Fascinating post – I hadn’t realized that about Austen’s two novels — the way an author writes a novel — the speed — makes sense — very illuminating! Hi Audra, thanks for visiting. I am struck by the process of two self-published authors – 200 years ago and today. I hope you have a chance to read Mr. Darcy’s Refuge. Even though Abigail completed it in 7 months, it does not seem rushed or incomplete. Quite amazing that she was able to produce it so swiftly. I’ve wondered how quickly Jane Austen would have produced Persuasion if she’d had access to modern word-processing technology. If I’d had to hand-write the whole manuscript, do even one revision on it, and write out a fair copy for the publisher, it would have taken me at least twice as long – and that’s with a ball-point pen, not a quill that requires mending and frequent dips in the inkwell! I have read a couple of your books Miss Reynolds and love them. I have been counting down the days for Mr, Darcy’s Refuge. the cover is so pretty. How do you think of the different variations? Each variation explores different parts of the characters of Darcy and Elizabeth, with an emphasis on different parts of their personalities as Austen describes them. Some of the variations are light-hearted and pure fun, others are darker, and some explore historical aspects more than others. This one explores more backstory for Mr. Bennet, the Fitzwilliam family and the Darcy family, while still focusing on Elizabeth and Darcy. This isn’t an entry as I bought the book last week and read it in a day (think I should give someone else the chance to enjoy it!) but I just wanted to say thank you to Abigail as I’ve enjoyed all the books she’s written, and very much look forward to the next one! It was very interesting to read about how you write. Thanks to you as well Laurel Ann for posting! Thank you! That’s lovely to hear. I read several (a lot!) book blogs, and I’m always struck when there is a comment at the top of the page essentially saying “no self-published books will be reviewed”! I mean really, what is the difference? In Austen and Abigail’s case, it would prove to be a mistake not to read their books! Thank you very much Mrs. Reynolds to give us another story of yours. I read all of your books but “Mr Darcy’s letter” that i’m reading now. I love all your variations but my most favourites are “Mr Fitzwilliam Darcy” “Mr Darcy’s obsession” and “A Pemberley medley”. Thanks for the kind words, Sonia! I see you especially like my ‘darker’ books, in which case you’ll love the one I’m working on now, which may give “Mr. Fitzwilliam Darcy” a competitor for my ‘darkest’ book! I have read some of Ms Reynolds books, and I really like her style of writing. I haven’t read this one, but the first chapter on her website and I think it is great! Darcy is so arrogant, so sure of Elizabeth’s accepting his proposal. I am sure the rest of the books will be just as great. What Ms Reynolds said about S&S and Persuasion is very interesting. I had never thought of that before. I think that the difference is obvious for her characters too. Anne is more likeable because we know that she has already suffered, and she has paid for her mistakes. I had such fun making Darcy arrogant at the beginning of Mr. Darcy’s Refuge. Hi Abigail, as a struggling writer myself I appreciate publisher authors’ experiences and recountings of how they get their ideas, their writing styles and time frames. So thank you! I have read some of your variations that deal with Darcy and Lizzie, as well as those modern day retellings based upon P&P or other Austen works and thoroughly enjoyed both! Do you have a preference as to which you prefer to write and why? Thank you for hosting the giveaway, Laurel Ann! Hi Lori! I learned a long time ago that I can only write things I want to write – if I try to write something to meet someone else’s standards, I get nothing but writer’s block. I enjoy writing both my regency variations and my modern novels, but I think the moderns give me more room for growth as a writer. In terms of readership, the variations come out far ahead. This book sounds wonderful (but truthfully anything with Darcy sounds wonderful). What I love most about Austen’s style is the romaticism of it. So much is implied in the words. It’s kind of a “less is more” mentality and it leaves so much to the imagination. It’s because Austen leaves so much to the imagination that we have room to write variations, and I love that. While I write with Austen’s characters, I don’t try to write in her precise style – as if anyone could! Instead I go deeper into the characters’ point of view, and I do include some intimate scenes in many of my books, which Austen didn’t have a choice about. Abigail, Although I love all things Austen, there has always been something troubling about S&S. I could never put my finger on it. While reading your comments, I felt the lightbulb above my head go on. Thats it!!! I found you first in my quest to find more Austen in my early Austen days. I felt I hit the jackpot when I discovered your what ifs. I am selfishly grateful you have adjusted your life for more writing time. And I now have this great urge to visit Cape Cod. Thank you!!! You should definitely visit Cape Cod, Becky. Some of us at the Decatur Book Festival were talking about having a JAFF reader/writer gathering there some day! I can’t wait to read this, as I adore all Abigail’s books. Do you think that Persuasion flows more smoothly because she was in poorer health at that time in her life, and maybe she wrote more from the heart than the brain? Whereas S&S was something she’d been tinkering with for so long that she overthought it and just was glad to get it finished. Does that make sense? I’ve wondered if she might have revised Persuasion less than some of her other books, since it was the last month of revisions when she became noticeably ill. I enjoyed all the what if scenarios that Abigail has written and I think that’s interesting about a book being written ‘too slowly’ or ‘too quickly’. I was taught in my writing classes to write each day and its sounds like that makes sense based on on what you’re say. I’m strongly in favor of writing each day, even if it’s only a paragraph. If only I could convince my life to cooperate with that strategy! I love Abigail’s works regularly as well. I am only missing two. I love the self-published ones. The whole thought of it taking away is repulsive to me. What is wrong with these people? I agreed totally with Becky C’s comments. S&S has always been a glitch for me at times. On the other hand I love Persuasion. I loved all the points about that made above. I thought it was noteworthy that Abigail felt the modern day series allows more room for growth. I know over time our favorites can change. Are there any she’s especially attached to in both the Regency and the modern? Looking forward to reading Mr. Darcy’s Refuge. I have read all the other variations, discovering Abigail early in my reading of Jane Austen FF. I loved all of them and find them very engrossing and enjoyable. How do you get inspiration to write your wonderful and very romantic Pride and Prejudice books? How do you get ideas to put Darcy and Elizabeth into all those different settings? Are there any advice you would give to young and future upcoming authors? I enjoyed Mr.Darcy’s Refuge very much! As always with your P&P variations I finished reading it in two evenings and as always after reading this one immediately wanted to read the next one:) Colonel Fitzwilliam was particularly fabulous in Mr.Darcy’s Refuge! Could you share some details on your new P&P variation currently in work? And please do not enter me into this giveaway. Could you please share with us some details on your new P&P variation currently in work? Abigail: I cannot help but think of the contrast on how Miss Austen wrote her novels and how they are written today. Yesteryear: Ink, paper and lots of patience! Today: A word processing app = Ebook! How Miss Austen accomplished such a task makes me admire her all the more. Does anyone else appreciate the difficulty in writing a manuscript in Jane’s day? To possess the creative gift of story writing at all is a divine mystery to me. I agree! I carry a notebook with me to jot notes and thoughts down and I had a creative inspiration during my lunch hour and my hand HURT after 45 minutes of writing. Isn’t that sad! We are very spoiled with our laptops/computers. I can’t imagine sitting at a desk all day, with ink and paper as Jane did. Makes me appreciate and love her all the more! It’s so true! There’s a learning disability for handwriting called dysgraphia, and the screening question was to ask people if their hands hurt when they were writing. People without dysgraphia would say no, and people with dysgraphia would say, “Well, duh, of course! Doesn’t everyone’s?” But about 3 years ago the screening question stopped working because so many people answered yes, just because we’re out of the habit of handwriting for more than a minute or two. I have read only 3 of your books, but I am catching up.  I just got into JAFF the past year or so and have really enjoyed the stories. I have found some really good authors, you being one of them, and now I have a huge stack in my “To Be Read” pile. But I am going on vacation soon so I hope to get that dealt with at least partially. I am curious, for people like me who used to avoid JAFF because of fear that it would somehow mess up the originals, what do you say to them when you meet them? Thank you for introducing Abigail Reynolds, as I have not read any of her books, but I do intend to. (This is not an entry for winning a digital copy of “Mr. Darcy’s Refuge” because I plan to buy a hard copy.) That was an interesting point about Jane Austen finishing “Persuasion” so quickly; she probably realized she did not have a lot of time to agonize over it, so she just got it done. I am looking forward to reading Ms. Reynolds’ books! How wonderful to hear about th8is new book just coming back from vacation. I always think the longevity of a series style book is incredible. Thank you for another wonderful story! It’s interesting to know that Mr Darcy’s Refuge was quicker to write than the others. I felt it was a lighter read than others of your books that I’ve read (such as Mr Darcy’s Obsession, for example) which makes sense, seeing what you’ve written here. I really enjoyed Mr Darcy’s Refuge, particularly how Darcy’s character unfolds to Elizabeth, it’s just lovely! It amazes me that you’ve managed to come up with so many different scenarios for Pride and Prejudice and I like how well thought out the changes are, after the point that each story diverges from Pride and Prejudice, one difference can have a knock on effect that means the story ends up taking a very different turn. Have you thought about doing a variation of any of Austen’s other novels? I enjoyed reading your perspective comparing how long JA took to write her first and last novels and the result of it. 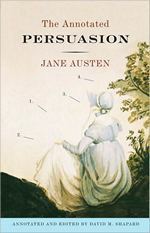 It’s no wonder that I could not finish S&S but have not much difficulty reading Persuasion. I hope you will continue to write different what-ifs scenarios for our beloved couple and may be try your hand at other variations of Austen’s novels.